This past week, those within driving distance said goodbye to our friend Herbie Knecht. Those of us who couldn’t be there in body, were definitely there in spirit. Herbie’s son, daughter and sister, not only knew their father and brother well, but made sure his next gig would be well populated with others of his kind. His final resting place is in southeast Louisville, inside the outer beltway, at Resthaven Memorial Park. They had heard a whole slew of horseracing fans from across the decades were there, and figured that would be just the place for horseracing-crazy Herbie. Knowing Herbie, I’m sure he teared up at their thoughtfulness. Julie summed up Herbie and why we loved him with her brief description of the information about his viewing and service. She posted on Facebook this simple little paragraph that speaks volumes about Herbie and why her brother was, and is, so special to so many of us. Herbie was one of the best Racing fans the sport could ever hope for. He loved it and was devoted to it. He made annual pilgrimages to special races, or at least made sure he was in front of a TV, somewhere. He loved Racing history, Daily Racing Form photographer Barbara D. Livingston’s regularly stunning photos, jockey-turned-songstress Liza G. Fly’s kind nature and wonderful songs, Secretariat, and Zenyatta, to name a few. He was passionate and opinionated about the Sport of Kings and the University of Kentucky Wildcats, and Baseball. One of the greatest days of his life was meeting Triple Crown winner American Pharoah, last year. His family knew his passion and played to it. In 1991, his sister Cindy even made sure his birthday cake had the right Churchill Downs and Kentucky Derby theme! Herbie was a truly multi-faceted individual. He cared deeply about his family and friends. He wasn’t ashamed to admit he was scared, or show tears. He had a musician’s soul and shared it often with posts of YouTube Classic Rock song videos that voiced his own thoughts and emotions. He had insomnia a fair bit of the time, which was great for the rest of us sharing the night with him. He made us laugh, think, reminisce. He was an amazing man in quiet ways. I never got to meet Herbie in the flesh, but I did get to talk to him on the phone a couple times. We tried to meet up, but a doctor appointment and my traveling schedule conspired against us ever sharing that bear hug we always hoped we’d share. Somehow, though, we still had a closeness that went beyond Facebook and interactions there. I won’t pretend that we were super close and shared intimate details of our lives with each other, but it didn’t have any bearing to our connection. I wasn’t alone in this special bond with Herbie. He had it with many of his friends on Facebook. He was just one of those people. Herbie loved at full-throttle. He loved horses, dogs, music, sports, us, to name the big ones. He had suffered a lot of loss in the past few years and his heart never completely got over it. You could tell. He wore his beautiful, big heart on his sleeve. Sometimes, you just knew he was waiting for his turn to leave, because missing those he loved was nearly overwhelming. But he hung in there, because he loved his life, too. He fought hard for it. Herbie had spent 2016 in and out of the hospital many months, due to complications from Diabetes and Congestive Heart Failure (a bad Daily Double, to be sure). We all knew how miserable he was, and tried to keep him cheered, while selfishly reminding him how much we loved him and needed him with us. He was a fighter for those who loved him, but I think he finally decided it was time to put himself first (just this once) and to go. Herbie walked out of this world on September 8th. I wasn’t there to see it, but I’m pretty sure his dog Sable was there, as well as his parents and grandparents. It wouldn’t surprise me if he shortly found himself surrounded by Racing greats, petting noses, rubbing foreheads, and sharing stories of a life well lived by a man deeply loved. His obituary says, “he is survived by a daughter, Tara Beam (Tony); a son, Herbert “Buck” Knecht IV; two sisters, Cindy Cottrell (Mike) and Julie Portnoy; a niece, Amanda Cottrell; a nephew, Cameron Portnoy; his friend, Mike Gumble; as well as a host of friends.” Somehow, “a host of friends” just doesn’t give the scope of how many of us are missing Herbie with every passing day. Now, there is the realization that there will be no more late night video postings, or spirited discussions about…anything…like there was when we had Herbie in our lives. There are now dozens of us with a hole in our lives. Miss you, Herbie. Just miss you. Herbie (red cap) with Brave Ruler at River Downs, the same day Kentucky Derby winner Spend A Buck won the Cradle Stakes. Ok. I’m listening. At this level, the threat of a paying customer is always intoxicating. I’m a little breeder with a nicely bred stallion* who throws beautiful babies, but I’m not even close to well off, let alone wealthy, so breeding babies is not something I’ve done for a while. I don’t have the means to raise them properly and get them to the races, or save them all and turn them out on acres of green grass, like the higher end stallion owners and racing breeders can. It makes sense to “stand down” for the time being. 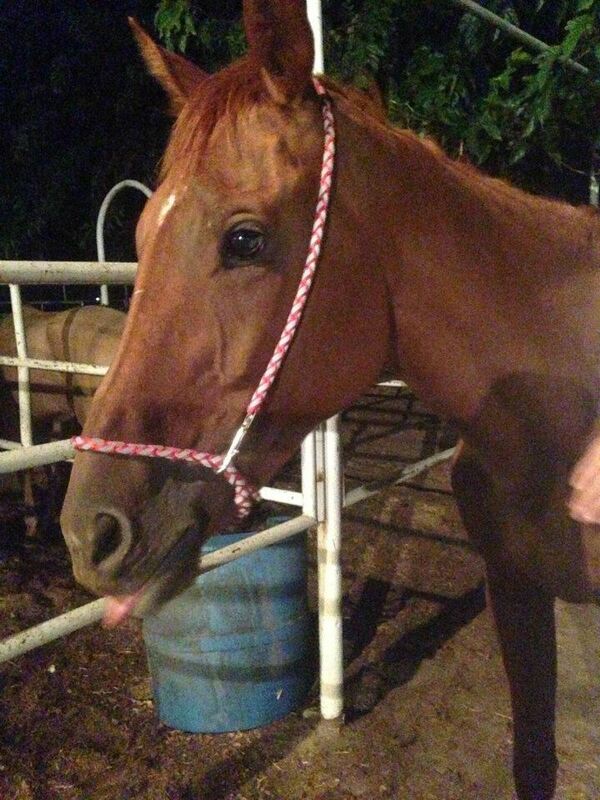 Anyway, this mare owner tells me that he will “give” me this wonderful mare for FREE!!!! All I have to do is come get her…Oh, and I’d have to pay the $1500 stud fee owed on the baby she’s carrying, that I don’t want…and I think there was a $300 board bill that needed paying, as well, but the actual mare wasn’t going to cost me anything! When I politely refused the “offer,” I was lambasted for not taking advantage of this “FREE!!! !” mare, who would be so great with my stallion. I pointed out that no matter how “free” she was at the beginning, she was going to eat…and eat for two…and then feed a baby that I didn’t want and no guarantee of selling. It would all cost money, not counting vet bills, et cetera. Angrily, he countered that I had no business in the Horse Business, if I couldn’t afford a free mare. I pointed out that he couldn’t afford a $1,500 stud fee, or the board he owed the stallion owner, so he really had no business calling me out for having the good sense to stop breeding before I got myself into a financial mess…and put two innocent lives in the middle of my bad decision. My position clearly offended him, and he hung up on me. 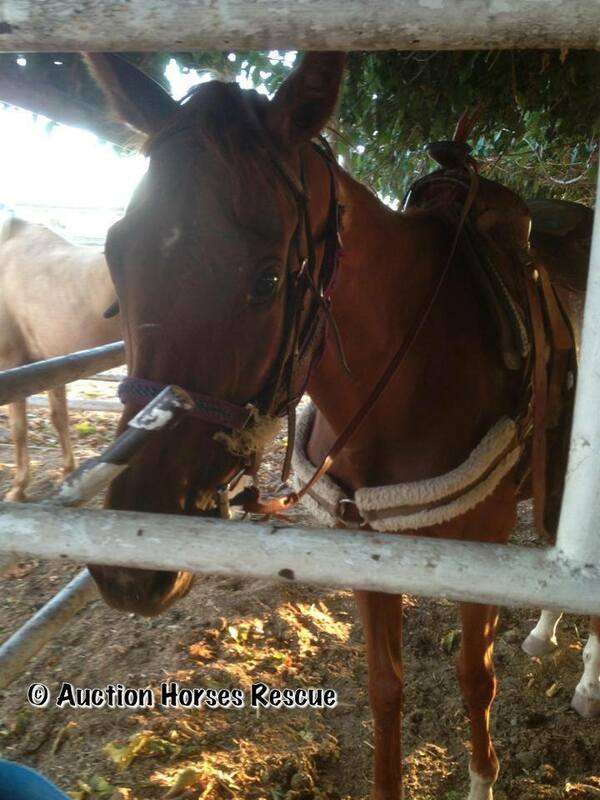 He later sold the mare, still in foal, through an auction in which she brought about $600. I hope she and her baby made it to a good and worthy new home. She deserved it. A lot of broodmares end up in places like Cymple Rhythm did, simply because someone could not afford to feed them, let alone breed them! “Della”, the night of her rescue. For the caring, but clearly uninitiated, and clueless horse lovers out there, I present you with the following post from Caroline Betts, of Southern California Thoroughbred Rescue, who posted the following on her own Facebook page. Her friends, most of them horse owners at one point or another, responded with their own nuggets. Quick Della – Feeling better after a few days of care. When someone brought up the suggestion of doing their own vet work to save considerable money, Caroline explained why her organization’s costs are higher than many horse owners. For those of you reading this who may not be fully aware of the extra responsibilities that legitimate rescue organizations face, read on. “I have sympathy for the notion of cutting vet costs wherever possible. 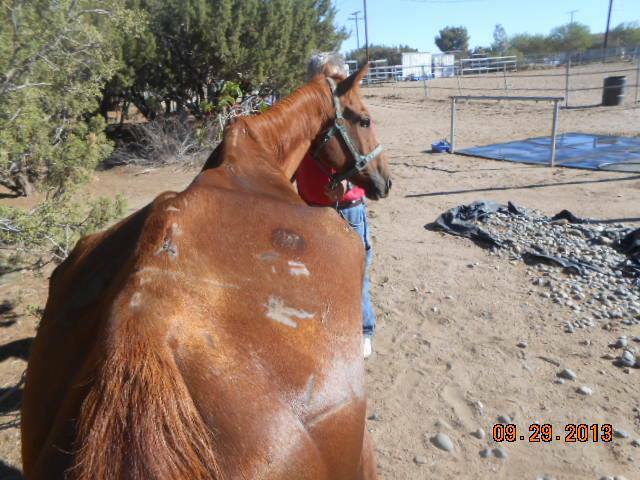 As it happens, our vet bills are annually only about 5 percent of our expenditures – they are high on intake of a starving horse however. As it goes, neither me nor any of our caretakers need to learn how to do things ourselves. We’ve all owned our own horses for many years, long before becoming involved with the non-profit, so all of the routine stuff is certainly doable by caretakers of the rescue’s horses. There are two reasons that the nonprofit doesn’t always have caretakers administer care to horses directly and in both cases it’s because of the need for accountability to donors and grantors of the non-profit. 1. 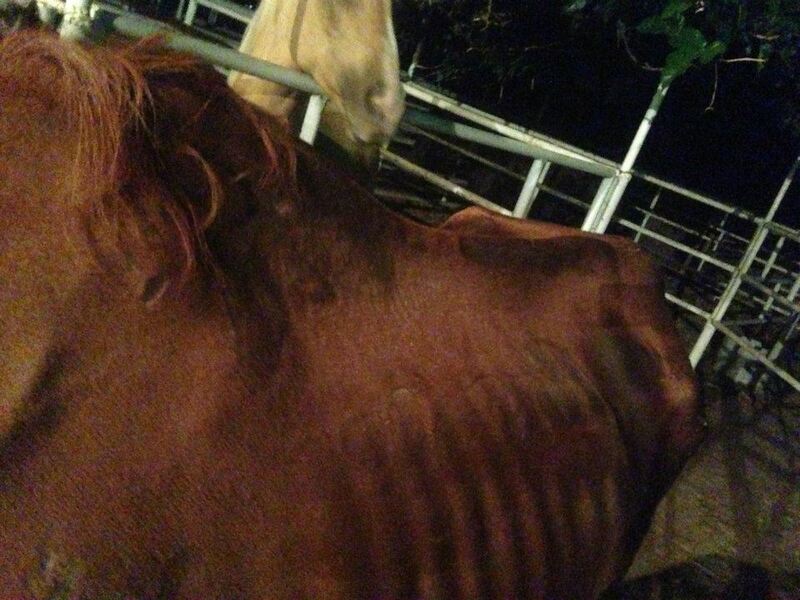 When we take in a horse in very poor condition, and it could collapse and die at any second, the nonprofit requires that a vet see it before anyone administers a damn thing. Especially anything involving needles. If we try to do it ourselves, and something goes wrong, we are in big trouble with donors and grantors and correctly so. We have to put the horse first. Then another reality check for those who don’t know how these organizations work. In other words, “Free” is not free. It will take months to get Della up to the condition she needs to be, in order to achieve and maintain good health. Right now, depending on where you are, Alfalfa hay is easily $13 a regular bale (about two days worth of hay for a horse, depending on the size and quality of the bale). Then there are supplements to help her overcome deficiencies she’s likely experiencing. They can run anywhere from $10 to 5 times that, maybe more, depending on what supplements are used and how big a bag they need. Maybe she has other needs as she recovers from starvation. For some insight into what it takes to correctly salvage a horse from emaciation, check out this information from U.C. Davis [http://www.vetmed.ucdavis.edu/ceh/docs/horsereport/pubs-July2012-bkm-sec.pdf]. Obviously, it’s not “One Size Fits All”, which means costs vary. So, as you contemplate whether or not your measly $5 can do any good for one horse, consider the bigger picture. Think of how your measly five dollars, and your friend’s measly five dollars, and my measly five dollars, and a couple other thousand or so people you’ll never meet’s measly five dollars, will have a significance for animals none of us are ever likely to meet, but we will always know we helped make a difference for them. P.S. Contrary to what you might believe, I don’t spend most of my time defending the meek and the downtrodden, but it doesn’t mean I can’t—and you can’t—funnel off a trip to Starbucks ™, or a foot long sub from Subway ®, or breakfast at McDonald’s, just once in a while to help these horses who have no other means of survival, other than what we give them. And if you can do more, more often? Do it. You’ll be proud of yourself and that’s not a bad thing, either. *The “How I Became a Stallion Owner” story is for another time. I helped save a life, last night. It wasn’t how I intended to spend my evening, and I can’t take credit for any heroic actions that saved this life, but I was a participant in saving a life from a sad, tragic, and totally unnecessary end. It was so easy to do (considering the enormity of the task), that I knew I had to tell you the story and encourage you to do the same. It started with an email I received from the Southern California Thoroughbred Rescue [http://www.sctbrescue.org], as 6:30 p.m. approached. I didn’t get the pictures embedded in the note, but the need was clear. 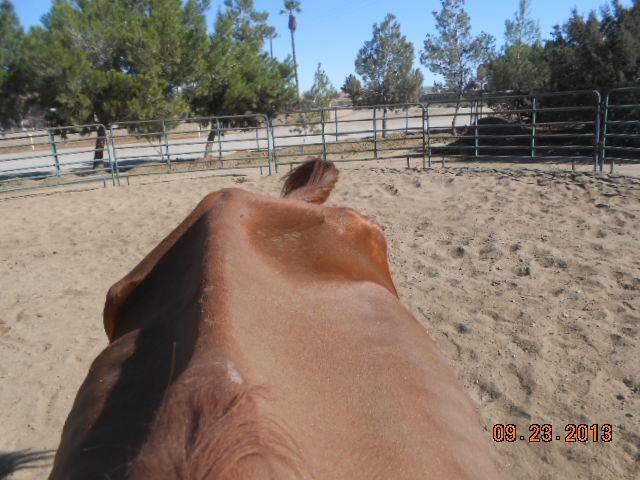 The email went on to state, “Dear Friends, this tattooed, ten year old OTTB mare is at auction this evening…We have a space for her, but no funds to support the rescue and rehab of another horse in desperate need of help. We would LOVE to help her. We have a bidder on the auction lot.” Later, when I was able to see the photos, this is just some of what I saw. I’m lucky. 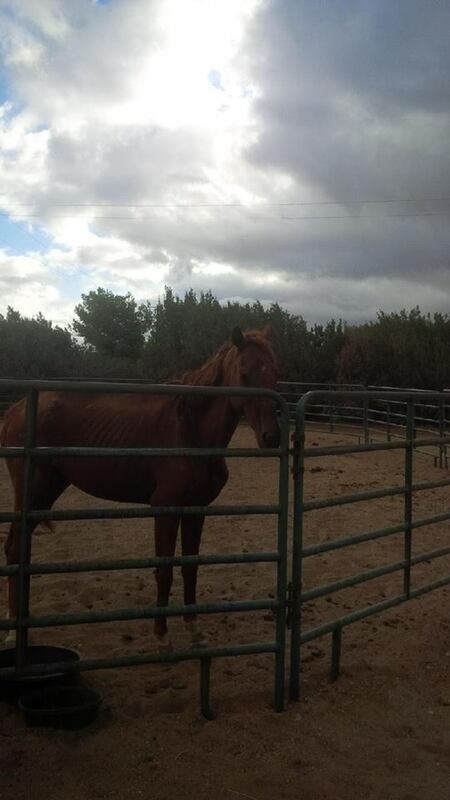 I have a job and a way to make sure my four horses are taken care of well, and never know painful neglect and hunger. 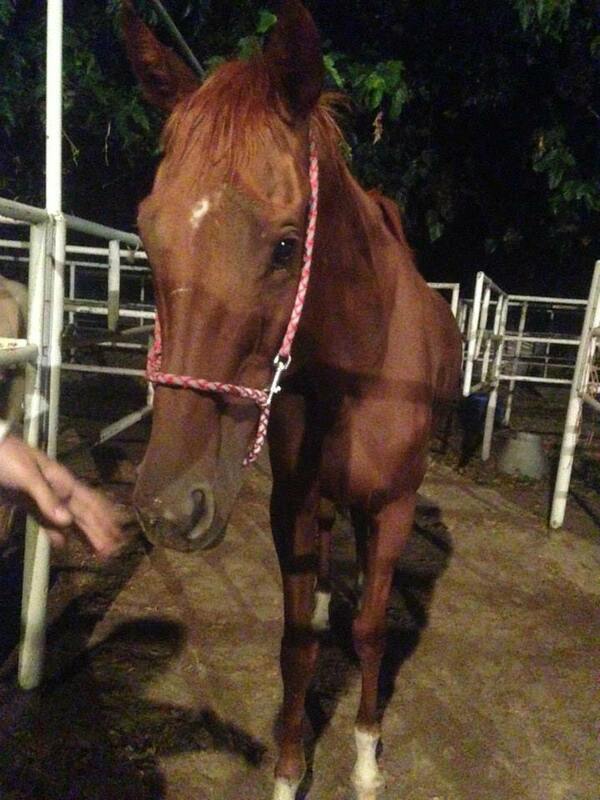 This mare, Cymple Rhythm, has not been anywhere near as fortunate, at least not in recent times…That is until her luck changed a couple nights ago, when Auction Horse Rescue [http://www.auctionhorsesrescue.com] spotted her and put out a call to their network of friends and fellow rescue organizations for someone who could take her, if they bid successfully. Southern California Thoroughbred Rescue stepped up and said they had a place to keep and rehab her, but needed funds for that effort. That’s when the email went out to everyone and anyone who had ever expressed interest in the organization. Donations flooded in from all over, including my $30. I also decided that I could forego a few things to sign up for a recurrent donation of $20 per month. From what I could tell from Facebook posts on the SCTR site, many others had cracked open piggy banks, searched through jacket pockets, and like me, gone over their checkbook to see just what could be done to make Cymple Rhythm a winner one more time. Yes, this pretty Chestnut daughter of Rhythm and Cymreig, by Lear Fan won her second race – a claiming race at Fresno, of which she was “much the best”, winning by 4 ½ lengths under Adam Landeros. She never again had her picture taken in a Winner’s Circle, though she made nine more tries at it, never doing better than fourth. Her last start was August 10, 2008 in a $3,200 non-winners of two, lifetime, going two turns at Ferndale, in California (Ferndale is a “bull ring” and it’s track is only 5/8th’s of a mile around.). She finished fourth, beating one horse, picking up her last check ($394) and disappearing into her next life, whatever that was. Sadly, not everyone who owns a racehorse has deep pockets or vast acreage on which to retire their horses when their racing careers have ended. So, five years later, Cymple Rhythm ended up in a feedlot sale, in a small pen. Presumably, to sweeten the deal, she wore an English saddle and bridle. As you can see from the photos, the mare’s condition was well beyond poor and smack dab in the middle of “criminal” (my own opinion). Megan Gaynes, of Auction Horse Rescue, found Cymple Rhythm and was able to discern enough of her tattoo to get her identified. The story appeared to be that her previous owner could not afford her and finally turned her into the sale, but not before she looked like the pictures here. I don’t recall the whole story, but there may have been something about the mare trying to live off fallen acorns – not exactly any domestic horse’s feed of choice. The point of this story is not to make you feel especially angry or sad, though I’m sure you feel both if you looked at these photos, but rather to let you know how very little it can take for all racing fans to make a difference in the lives of many horses that might otherwise come to a far worse end than Cymple Rhythm, and too many like her. This is a call to action for every racing fan who has ever attended the races, watched them on TV, or read a story about them. You…yes, you…can do something truly important and life changing as often as you like or can! If everyone who attends the races, at racetracks all over North America, donated just $10 to at least one Off The Track Thoroughbred Rescue (OTTB) organization in their area, or to several other charities with a more national, rather than local, emphasis, think of the money that could be raised to give these horses a safe retirement! 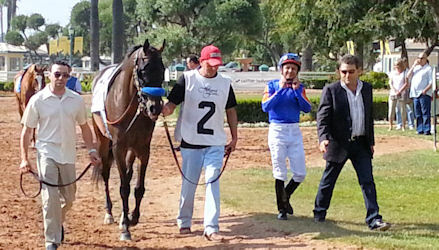 Your local racetrack, if you have one, may have a program in place to help retired racehorses in your area, or you can contact organizations such as Thoroughbred Retirement Foundation [http://www.trfinc.org], Thoroughbred Aftercare Alliance [http://www.thoroughbredaftercare.org], or Thoroughbred Charities of America [http://www.tca.org]. Every little bit truly does help, so if your means allows you the opportunity to send what you can (no matter how little it might seem), please do. You won’t regret it, and I think if she could talk, Cymple Rhythm, and all those like her, would thank you for the opportunity to feel good again, play again, and be touched by loving hands, nurturing hands, again. Then you will know that you, too, have saved a life, and made it possible for horses like Cymple Rhythm to find new homes where they will never know this kind of suffering. Caroline Betts posted this update on Cymple, just two days after she arrived at SCTR’s facility. No horse should look like this. Cymple Rhythm’s veterinary examination at Apple Valley Equine Hospital just ended. She has a BCS of 2 [http://www.habitatforhorses.org/the-henneke-body-condition-scoring-system], the swelling and heat observed in her foreleg is due to a superficial scrape, she is NOT in foal (hurrah), she has a gut full of 20-30 pounds of sand, horrendous teeth, AND she has almost perfect radio-graphs for both front fetlocks which the vet described as “about as good as you could hope for for a horse that has been treated as poorly as she has”. All that is needed, really, is food … and psyllium Yay! Cymple Rythmn, the morning after her arrival at the SCTR facility. Look at her demeanor. “Della” is beginning to realize she’s safe! This message could be directed at you. About 4 years ago, my “adopted big brother” Kirk told me about a fantasy racing game in which he’d become involved. It was simple. Real horses are presented for “auction” and with our pretend money we bid in $10k increments after a $50k base with the balance of of the $5 million dollars with which we start each January 1st. After winning a horse in a bid, it was yours until you sold it, dropped it from your stable, it retired, or sadly, worse. You also had the option to partner with someone, with whom you would go 50-50 on any earnings. I was busy and didn’t have time for tracking horses, but Kirk insisted on how easy it was to participate, and how much more fun it made watching or following the races when “your” horse was involved. Your job was that you had to track your horse and update its earnings in spreadsheets. All your stables’ earnings became what you had to spend on future auctions, as you ate through your $5 million seed money. Equibase and the Daily Racing Form are invaluable tools in this game. After repeated urgings, finally, in 2011, I took the plunge and joined the game. I had pretty decent luck the first year, and had the good fortune and thrill to “own” horses like Nehro and Tizway. I also was dumfounded to be the only bidder on Birdrun that January, and he’s been an awfully wonderful horse for me – repaying me many times over, as has Hymn Book ($60,000! ), who I positively stole five months later. 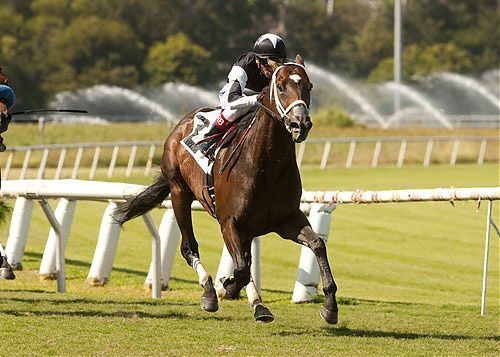 Another near and dear to my heart has been Caxia Electronica, who, for his very reasonable $180.000 purchase price, has rewarded me with thrilling victory, after thrilling victory since I acquired him in May, 2011. Many of the horses in my stable are east coast based, but a few are out my way – here in the great wide west of the United States. One in particular has particularly brought me great joy. As the game got underway in 2012, I was the under bidder for one of my favorite warriors – Game On Dude! Exercising my right to blow a lot of pretend money, I contacted the winning bidder and practically begged her to partner with me. To my shock, she agreed! My account balance immediately got a $1,255,000 deduction, but I didn’t care! I was captured by this horse and now he was “mine”! I was happy to share the thrill of “owning” him with my far away partner. So what if I had to split his earnings in half with her?! I knew the risk was the he wouldn’t repeat his incredible run from the year before, but I didn’t care! As “real” horse owners know, it’s not about the money – it’s about the horse! And this is the point! This silly little game fosters a deeper connection with the real thing; I’m guessing in much the same way that Fantasy Football leagues do. Not only did I start paying attention to national racing in a way I hadn’t for quite some time (not counting my local attention to my real life gelding’s attempts to break his maiden ), I found myself excited about races I normally do not follow. I began paying attention to trainers with whom I wasn’t familiar, and I started spending more time at racing web sites. Most of all, I thought it would be a thrill to someday actually stand at the rail and root my horse home, at the top of my lungs. My opportunity unexpectedly came on the heels of two heartbreaking events: in May, Betfair Hollywood Park announced it would close for good this coming December, and in June, my mother died three weeks shy of her 84th birthday. Most people wouldn’t equate the two, but Hollywood Park is the track I first went to when I came back to racing after the heartbreak of watching Ruffian breakdown, and I had several significant events happen to me there. My mom was supportive and encouraging for me to pursue my dream of being a part of racing, not just someone who watched three times a year. The timing of my mother’s death opened up a rather weird, but wonderful opportunity. First, my mom’s birthday was July 3rd and my significant other and I decided spreading Mom’s ashes on one of her favorite beaches in Southern California was something she would have appreciated, since she hadn’t been on a beach in over 20 years. Second, my mom knew how much the news of Hollywood Park closing would break my heart, and would have encouraged me to go to my last Hollywood Gold Cup which was occurring the weekend after her birthday. So plans were made to combine my bereavement leave and the following weekend, to honor my mother and witness something special for the last time. To make it an even stronger pull, Game On Dude was going to be there! At last! My chance to watch one of my very favorite FRG horses! So we drove the 7 hours to California, on my mother’s birthday, and were lucky enough to camp at one of her favorite beaches, spread her ashes in the surf at sunset. That night, we were pleasantly surprised by fireworks up the beach (she would have loved it!). Three days later we picked up Kirk (who lives within walking distance of Santa Anita), and the three of us headed across the L. A. Basin to watch something special one last time. To make the trip even more worthwhile, one of Kirk’s horses was running in one of the under card stakes races (and won!). We had an amazing day and we brought dollars into the local economy in a number of ways. 3. 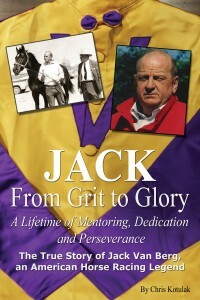 One copy of Jack: From Grit to Glory [http://jackfromgrittoglory.com], signed by Hall of Famer Jack Van Berg himself. 4. One copy of ex-jockey and very talented songstress Liza G. Fly’s [http://www.reverbnation.com/lizagfly] new CD “Zenyatta” [http://www.youtube.com/watch?v=pz2kvJf22gs&feature=youtu.be] featuring the title song. 5. 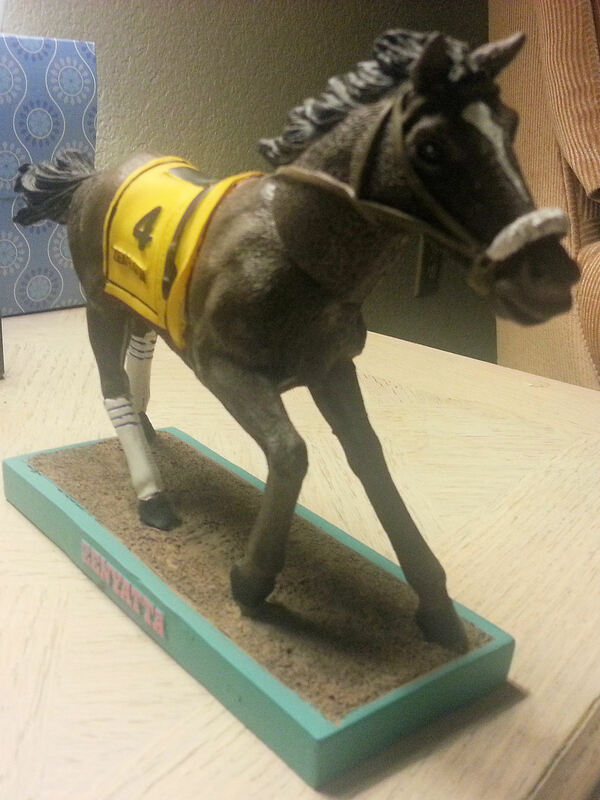 Two trips to the Winning Colors gift shop where I scored the LAST Zenyatta bobble head doll that will ever be sold at Hollywood Park, as well as assorted other memorabilia to the tune of $70. I also used the no name ATM, so someone made an extra $3 from me, because Zenyatta and couple of other items had to be paid for in cash. 6. Dinner with Kirk, which benefited his local Fresh ‘n Easy market. 6. The local Costco picked up about $100 for the gas we purchased for the long ride home. 7. “Mickey D’s” on the way home. Most of the money spent on the trip (not counting gas) was spent in one day, because of a trip to see one of my favorite horses and game horses run one last time at the race track that set me on a path to participate directly in a sport that I can’t imagine living without. Imagine what Racing could do for itself, as a whole, if we spent time making our sport accessible and easy for others to follow and participate, in much the same way this fantasy game does? Imagine the impact that could have for people who make their living on racetracks across the United States, and the people at NBC Sports who have poured resources into broadcasting racing to people who might not otherwise see any other race besides the Kentucky Derby. I like to call this the “It’s A Wonderful Life” factor—One life touches so many. In this case, fostering participation in simple games like this one, or the online versions like the Fantasy Racing Game that the Blood Horse magazine has on their site [http://www.bloodhorse.com/horse-racing/fantasy-game], or the cool arcade ones you can find at some truck stops, may be the catalyst for a lifelong interest in our sport. It’s something to think about. I gotta go. I’m a week behind updating my earnings on my game spreadsheet. I want to be ready for the next auction and see if I have enough cash to maybe buy next year’s Kentucky Derby winner, or one of the winner’s of this year’s Breeders’ Cup races! p.s. My partner left the game a few weeks ago due to personal reasons. Per the rules of the game, that now makes me the the proud and sole owner of Game On Dude. Maybe it is only a game…but Hey! DUDE! NOTE: The first rule in Blog writing is “Be CONSISTENT!” Ok, I broke the rule. It’s been over a year since I put my thoughts down on virtual paper, but I’m back. I figure if someone finds this blog in their Internet travels and decides to “follow” it, the least I can do is my part by actually writing. 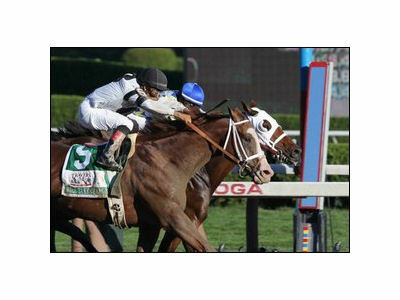 So, yesterday was the Travers Stakes (Gr. 1) and the winner was not one of the stars of the show. Will Take Charge was one of those horses that never really made anyone’s Derby Trail radar screen, other than his owners Mr. & Mrs. Willis D. Horton, and his Hall of Fame trainer, D. Wayne Lukas. Despite a win in the Grade 2 Rebel Stakes last winter and a recent second to future Belmont Stakes winner Palace Malice in the Grade 2 Jim Dandy Stakes, there wasn’t a lot of support for the flashy chestnut colt to be anywhere near the track photographer when the two-plus minutes was up. So imagine the surprise when Grade 1 winner Take Charge Indy‘s little half-brother poured it on at the appropriate time to grind past Kentucky Derby foe Orb and nail fellow shocker Moreno at the wire by a scant 6 inches or so. Perhaps the only person outside of his immediate connections who were not shocked by the outcome was Blood Horse blogger and columnist, Steve Haskin. Mr. Haskin warned his loyal readers just before the Belmont to watch two horses as possible spoilers for Orb and Oxbow — Palace Malice….and Will Take Charge. Though a Hall of Fame trainer, D. Wayne Lukas hasn’t been blinded by the limelight in recent years, as before. He’s been a reliable provider of income to his owners, but not as dramatically as he once was, when he was the second leading trainer by earnings to Bob Baffert and ahead of Bobby Frankel, Bill Mott and Todd Pletcher. Last year he only ranked 81st by earnings. With highs and lows so prevalent in this business, you can understand Lukas’ comment after the race about long time client Willis D. Horton. As fans, we talk about the owners, trainers, and jockeys as if they are separate from us, but they aren’t. They are fans, who unlike most of us, do have that extra connection to the sport that we all dream about. Somewhere along the way, they have been bitten by the same “bug” we all have, but their passion and means has carried them a step farther in the participation level. When involved at the higher levels of the game, it’s easy to go searching for the next big thing and move horses to the hot trainer, but it shows more than just class for someone playing at the upper levels to hang in with their trainer when he is spending many of his years as a footnote in history. It’s nice when that passion, dedication, friendship, and respect can be rewarded. Yesterday was one of those days for the Hortons and D. Wayne Lukas, because they went where some said they didn’t belong. If you are a fan of Southern California racing, and you watched Animal Planet’s “Jockeys,” then I’m guessing last Sunday, the first of July, pretty much sucked for you. Another black headline for racing and another possibility that some unfamiliar fans would think the worst about the sport, yet again. The whole day was just one bad roller coaster ride for me, as it was for others later that afternoon. I spent the day saying goodbye to a dog I’d had in my life for 13 years. My boyfriend adopted her from a rescue organization in 1998, when she was about two years old. We’d nursed her through a slow decline in the past two years as her degenerative spinal disease took its toll and rendered her back legs pretty useless and ignoring of her wishes. She could still make her tail wag when she saw us, but last Sunday it was clear to us that despite her indomitable will, her body was no longer living up to its part of the partnership and was now causing her pain she could no longer hide from us. Throughout a day destined to be thoroughly and utterly sad, I occasionally checked my email and was reminded by Equibase that “John Johny Jak is entered today at BETFAIR HOLYWOOD PARK.” YAY!!! Finally something to look forward to! Even if he didn’t win, or even hit the board, I was thrilled to see him entered again. I was getting a little worried. I’d missed the fact he’d had successful colic surgery over the winter. I won John Johny Jak, in a silent auction held by the Fantasy Racing Game I play, on January 13, 2012. Despite his game win in the Lure Stakes the previous November, as well as his respectable fourth behind Jeranimo in the Grade 2 Citation Handicap Thanksgiving weekend, I got him for $60,000 (I bid $200,000; minimum bid was $50k). I didn’t expect to win the Breeder’s Cup with this horse, but I thought he would have a respectable and probably long career. I knew my fellow game players were making a mistake in ignoring this horse. I knew who his trainer was, and I knew that was a huge plus in why I bid as high as I did. I mostly bid on him because I believe in his trainer, Kristin Mulhall. I wasn’t following the news closely, so I honestly didn’t know why he was gone for so long, but I knew Kristin was taking care of him, because that’s just who she is. She loves just about anything with four legs, and then some. I knew this first because I saw it in how she conducted herself on “Jockeys.” Yeah, “Reality” shows are always suspect, but you can’t fake how much you love animals, because they’ll call you on it if you’re a liar. If I had liked Kristin Mulhall before “Jockeys,” and later after peripherally knowing her through the “magic” of Facebook, I adored her when I saw how she was working the five-year-old ridgling to his first start after a seven-plus month layoff. His works told me she was toning and tightening him to at least a respectable showing. Unlike so many trainers who seem to think a couple of three or four furlong works (one a week, maybe) before a six or longer furlong race will do, Kristin worked him more than once every seven days: three at five furlongs, two at six furlongs, a tightener of three furlongs three days before his first start back, and refreshingly, one at seven furlongs nine days before his comeback race! NOBODY (hardly anybody) works their horses longer than the distance they’re entered to race anymore! Once a common practice among trainers who relied on conditioning their horses, the skill of truly conditioning a horse is practically a lost art. Lucky for “JJJ,” he was blessed with a “real” trainer. So Sunday afternoon, the outcome of the Robert K. Kerlan Memorial Handicap came when I wasn’t paying attention to the outside world. After dragging ourselves home from the vet hospital and acquainting ourselves with our new “normal,” I finally checked email and was greeted thusly. 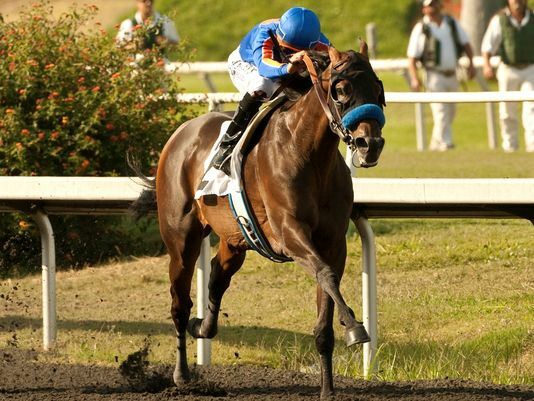 “John Johny Jak finished 1st by 1 3/4 lengths, on July 1, 2012, at BETFAIR HOLLYWOOD PARK in Race 7. Then I read the comment below this. Further investigation revealed the fabulous high, and the devastating low, that had transpired in less than a minute. And there you have the hardest part of being a fan of horseracing, and particularly a direct participant. Those lows that come to us all, frequently with little or no warning. It’s one thing to be a big fan of a horse and feel terrible for its connections when something terrible happens, but it’s another when that horse isn’t just part of your barn or your training stats, but something akin to your own child. A lot of people don’t understand that about the people working on the backside of a racetrack. There is a tendency for Frontside race fans to assume that everyone on the backside is in it for the money and horses are merely the commodity used to collect it. The truth is there are thousands of people working with racehorses that treat those horses better than their own kids, or their horses are their kids! We cry unashamedly when we lose one of these beautiful souls who almost always give us everything they have, because they love the game as much as we do. We mourn and grieve. It’s not about the money. In the days since the decision to save “JJJ” from further pain and suffering was made by his loving owners Roo and Juliana Kretz, hundreds of posts and comments have been made on Kristin’s Facebook wall expressing their deep condolences for all involved, and repeatedly stating how much Kristin loves all her horses, regardless of class level. It’s not about the money. So, still on the unwanted roller coaster, I fight back tears for the pain of a loss of somebody special. Quinne was special. Johny was special. While relieved that neither is suffering, I am probably most sad for the enormous gap felt by we, their caretakers, when animals like these are lost, whether to advanced age or the unexpected. In the case of the Kretzes and their horse, I know how I’d feel if I lost one of my horses, and how much more so if it was a horse who had brought me so many “highs,” as Johny brought them. You can ask Roo and Juliana Kretz, Kristin Mulhall, and anyone working in her barn. It’s not about the money. Yesterday morning, as I sat in front of the TV, DVR remote in hand, to watch the pageantry of Royal Ascot in anticipation of Black Caviar’s expected 22nd victory, I couldn’t help but feel wistful. As TVG first showed us the amazing tradition of Her Majesty’s entourage arriving by horse draw carriages and mounted Royal Guard, followed by coverage of thousands of Australians crowded into Federation Square to watch their beloved “Nellie” carry their national pride half a world away, I couldn’t help but think the odds of that happening in the U.S. today were the same as most of the odds on Black Caviar’s scheduled rivals, 99-1. As giddy as Americans were over Rachel Alexandra, Curlin, and Zenyatta, I don’t recall thousands gathered in public places to cheer them on with the same national pride. It’s been many decades since this nation came to a halt for a horse race with the same fervor the Australians displayed by staying up until one in the morning – for one race, for one horse. While many might cite Secretariat’s Belmont Stakes as the last time we came together as a nation over one horse, I think it is more likely that it was probably back when Citation was regularly the lead story on sports pages and radio broadcasts; and horse racing was held in the same regard as baseball and boxing. Back in the Sixties, I remember the nightly news showing the feature race at Santa Anita or Hollywood Park, and the Los Angeles Times always ran Bill Christine’s racing column. 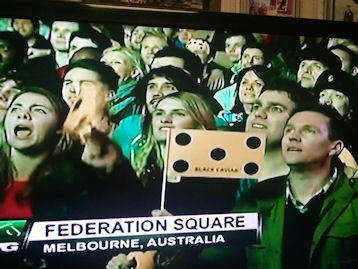 Thousands of Australians gathered in public and stayed up past Midnight to give their support to Black Caviar, running half a world away. 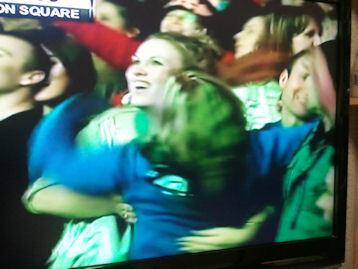 TVG showed us the reaction of the hefty Australian crowd as they watched their heroine on a huge screen in the square. The love for their horse was evident on their faces, and as the nearly catastrophic stretch run heated up, followed by the narrow victory of their best girl, euphoria was on full display. People of all ages, but most appearing to be much younger than our average fan age of 51 years in the U.S., screamed, danced, jumped around ecstatically, and hugged each other with total abandon. Australians react in relief and jubilation as “The Wonder From Down Under” keeps her record perfect in a heart-stopping finish. It was a great moment…and I was jealous. These people love horse racing. The Melbourne Cup is practically a national holiday. Why isn’t it like that here? When discussing the decline of racing fans in this country, one point has been brought up several times. That is, Americans don’t get out much, and those closest to most of our country’s race tracks do not spend their free time outdoors with animals, specifically horses. Few kids finish their day of chores by riding their beloved farm horse for a few quiet moments of contemplation before dinner time. Few kids have the opportunity to build a close relationship with a horse if they live in an urban area. With horses playing such a small part in our lives these days, most of us miss growing up learning to understand the majesty of the horse, particularly the running horse. Since racing coverage is so minimal in America, it takes a lot more work to develop that passion in a child. Obviously it’s easier if the child grew up in a rural area where horses are a normal part of life, but most kids do not get a pony for their birthday. Being a city kid myself, and my parents not being even close to well off, I did not grow up with a horse in my backyard (except my Breyer models I might have left outside after a day of playing Wild Horses). As it was, other than hanging on to a rental horse once in a while, I didn’t receive my first riding lesson until I was 18. I think I paid something like $6 or $8 a lesson. Lucky for me, though, when I was five and six years old, we lived in an apartment down the street from Santa Anita, in Arcadia, California. My father saw a sign on the street welcoming the public to the morning workouts, and he saw it as a fun way to kill time before I had to be at school. The school, intriguingly enough, was located across the street from the track’s six-furlong chute. So, my father introduced me to real, live, big, majestic horses and my life was forever changed. 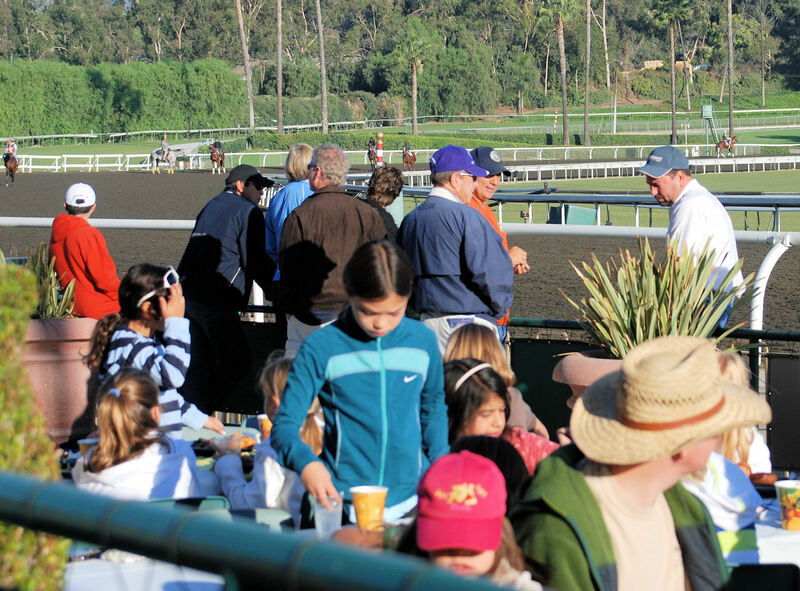 A group of young kids exposed to morning workouts the day after the 2008 Breeders’ Cup at Santa Anita. Not all of them will fall in love with Racing, but it’s a sure bet several will want to come back…maybe for a lifetime. 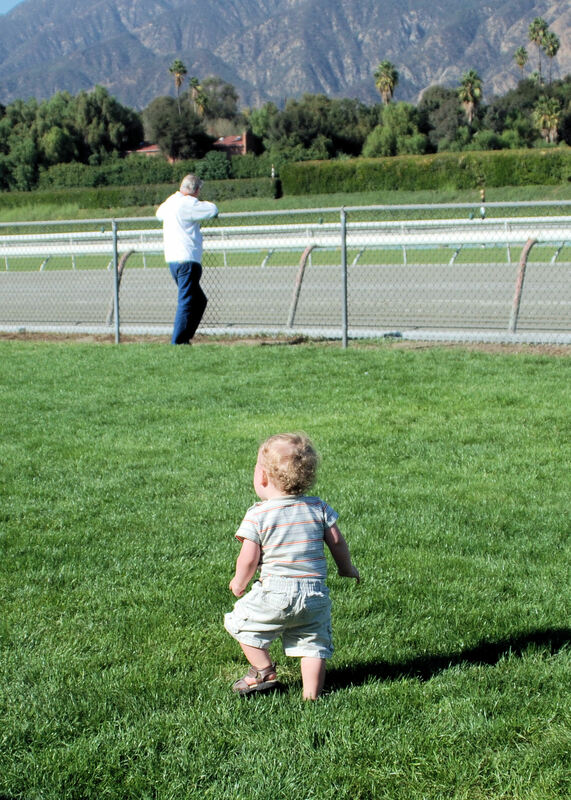 As I like to say, “Get ‘em early and you probably have them for life!” Every time I see a parent with a small child at the track, I want to hug them for taking the time to share their interest with their children. The next generation of racing fan. I think most of us come to our deeply favorite sports through our family, as I did. Race horses came first, the Dodgers came second. Both ingrained themselves through my dad taking me to Santa Anita and Chavez Ravine when I hadn’t finished my first decade. But someone I loved and to whom looked up made it special, and so it has remained. If you have children or grandchildren, find time to take them to your local track. Bring their friends, classmates, or whoever else you can load into the car! Racing is just as exciting at a “bush” track as it is at Churchill Downs. If you’re lucky enough for Churchill Downs to be your local track, take those kids and make sure they get into the Kentucky Derby Museum and explore all it has to offer. Regardless of which track you head for, you may very well ignite the flame in the next generation of fans. 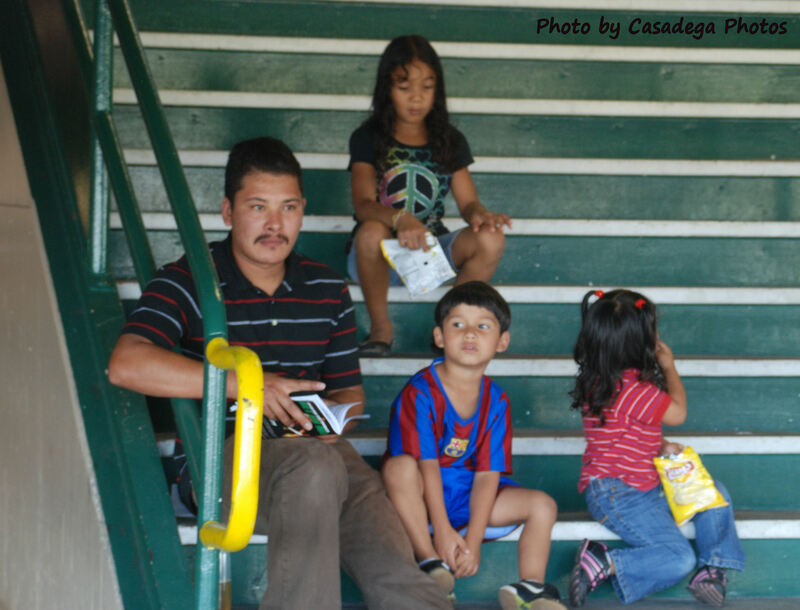 This man brought his kids out to Hollywood Park to see Zenyatta win the Lady’s Secret Stakes. Bless him! NOTE: Click the highlighted word for lists of all racing related organizations by state or province in North America to find a racetrack near you.